Tomei Expreme Ti Exhaust - Speedzone Performance LLC. - Checkout our No Credit Needed Financing Options and Apply Today for Free! The Tomei product concept is “To produce a great product for ultimate driving pleasure”. 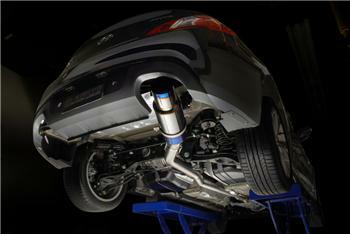 This time our latest product developments have been in these new Titanium exhaust systems. In recent years we have seen a growing trend in clubman racing series and more users enjoying their cars at track events. Seeing that there are power restrictions from the bolt on exhaust systems that are currently available on the market, we have decided to make a better product. Not for just power but for weight reductions and the best value for money product. So here we have our true competition use design exhaust system. We wanted to make an exhaust system that will allow you enjoy your car more from the sound of the engine. Increased performance gains with the best power and response was the main target points. Through the use of minimal bends and the optimum pipe size we were able to achieve this goal. To improve the performance of the engine with just the muffler system alone isn’t easy. So with the use of our Titanium material we were able to further reduce unwanted weight without compromise to the products overall strength. So with the strong commitment to our values and targets we were able to make a great product for all to enjoy. Our product was developed based on this philosophy, for enjoyment and results. Our Titanium material was developed with new revolutionary methods which helps save on unnecessary costs which help us pass the savings on to you. A high quality product at an unbeatable price. The package includes everything that is needed to install the product straight out of the box. No need to hunt for any additional parts as all the springs, clamps, bands and bolts are included to get this product onto your car immediately. We’ve done the hard work for you so you can enjoy your car with our product and know that the quality is there to last.